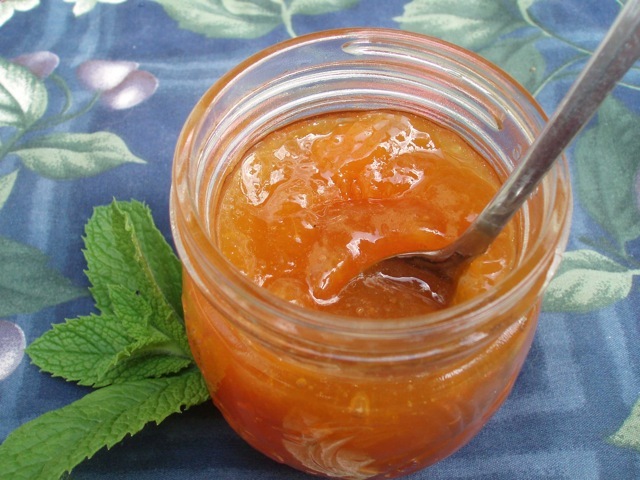 You could try other herbs — lemon mint, lemon basil, regular basil, scented geranium — in this smooth, soft jam. Cook the cantaloupe pieces over low heat in a covered preserving pan until they are tender, 20 to 30 minutes. Purée the cantaloupe by putting it through the fine screen of a food mill. Combine the purée in the preserving pan with the sugar and lemon juice. Stirring, heat the contents over medium heat until the sugar is dissolved. Raise the heat to medium-high, and boil the jam, stirring frequently, until a drop of it mounds slightly in a chilled dish. Remove the pan from the heat. Swish the mint through the hot jam for about 30 seconds. Scrape the jam clinging to the mint back into the pan, and discard the mint. Pick out any leaves that have come loose in the pan. Ladle the jam into pint or half-pint mason jars. Add lids and rings, and process the jars in a boiling-water bath for 10 minutes.